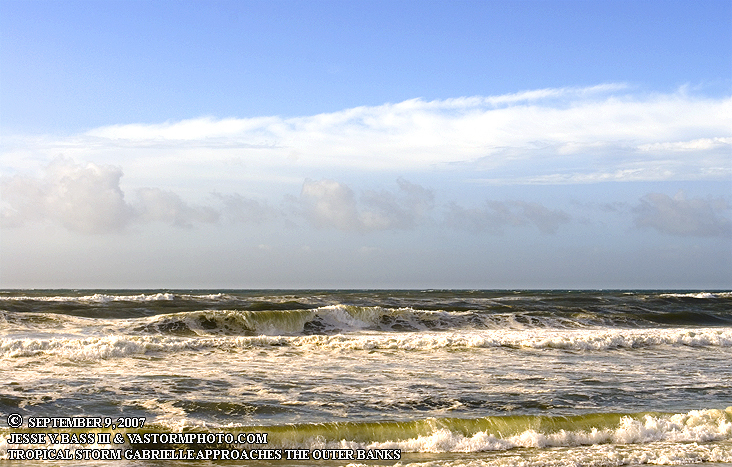 A small area of low pressure with a frontal boundary moved off the Georgia-South Carolina coast into the Atlantic where waters were warm and "untouched" for most of the hurricane season. After a drift to the southeast just off the coast and a battle with wind shear in the area, a sub-tropical storm had formed which was named Gabrielle. 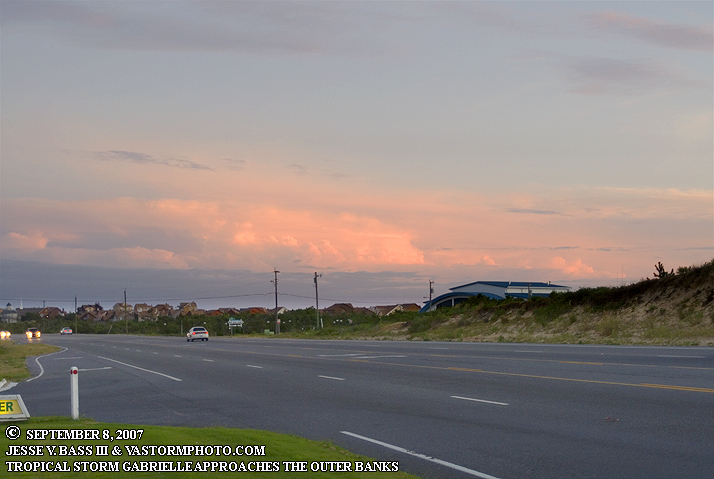 Mark and I went to the Outer Banks on Saturday evening to prepare for Gabrielle and what ever effects she might bring our way in Hatteras. Gabrielle had been going through wind shear again but in the evening on Saturday, the shear relaxed and the center which had been exposed, was now under the convection and starting to show signs of intensifying. 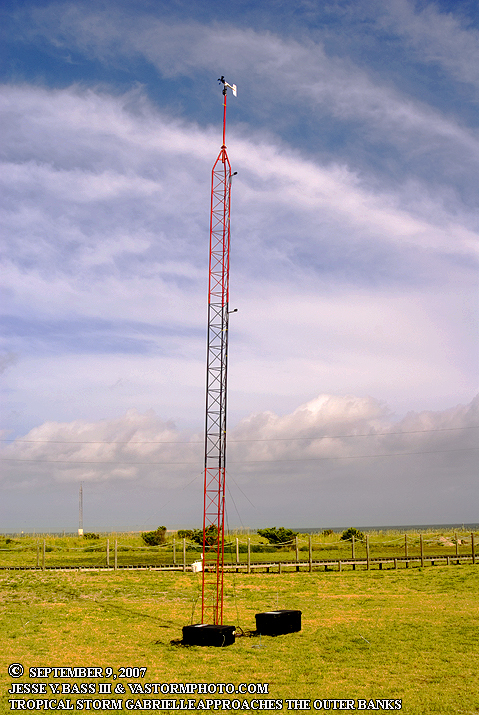 We went to the Coast Guard station in Hatteras to set up our new 10 meter wind tower to record data as well as send live webcam images and stream live video back to the website during the storm. When we looked around on Sunday morning, all we could see was a few clouds overhead, some thicker storms offshore, but big areas of blue sky overhead. The wind was increasing through the day, but rain never came. I went out to shoot some photos and video before the storm and some of that is what you see below. Finally, around 2pm or so, we decided to call it and head home as Gabrielle made landfall near Cape Lookout and that center was moving northward into North Carolina. More shear developed during the early morning hours of Sunday and blew the tops off of the thunderstorms near the center. those storms, or the mid-level circulation stayed near the coast of Cape Lookout for most of the day which is where fellow member and intern Todd Ferebee was located for the storm. He would call for updates and would tell me that the winds were pretty strong, say 40mph or so, maybe stronger at times, and rain was very heavy most of the day. He of course shot some video of the day and when I can get some of that I will try and post that here. 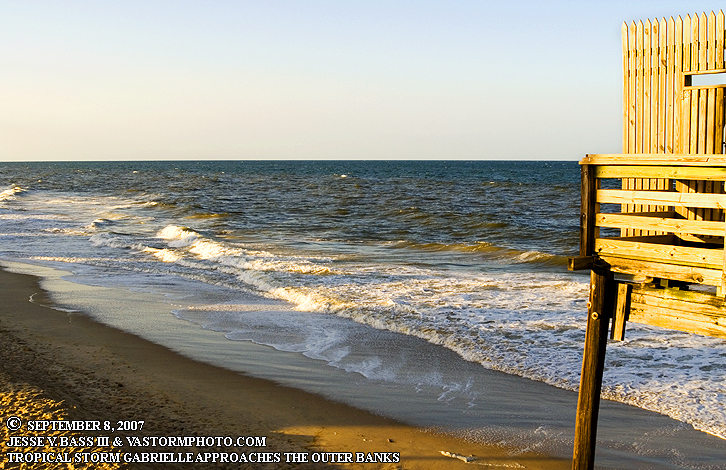 Gabrielle weakened quickly as it moved through North Carolina and back out to sea just south of Virginia. Below are the photos from the two days and a short video clip. 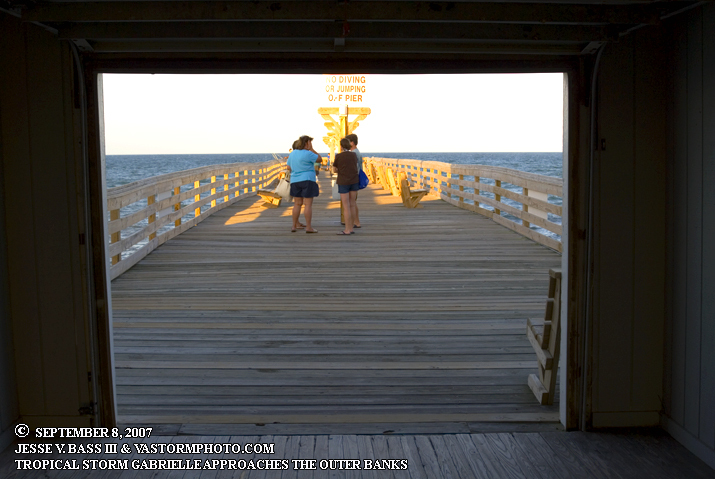 Taken from Kitty Hawk Pier on September 8, 2007 as Gabrielle made here way towards the Carolina coast. People were still on the beaches and in the water on Saturday with tropical storm warnings posted for the area. Wind was about 15-20mph, but sunny and warm. 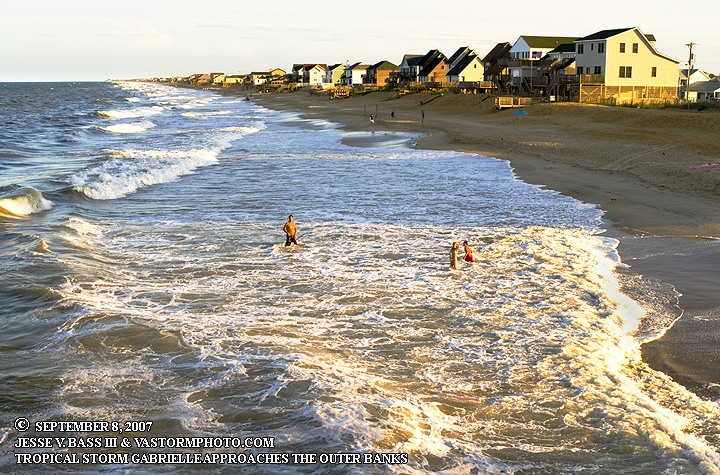 A farther and kids play in the water close to shore as Gabrielle was starting to get her act together further south off the Carolina coast. 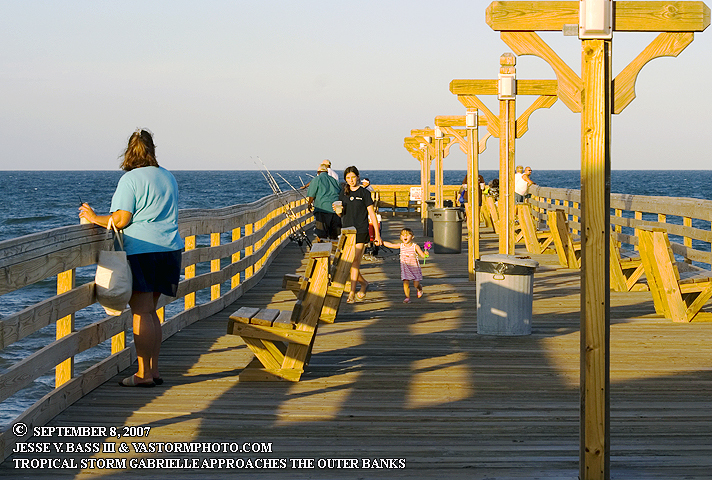 People on the pier talking, fishing and just enjoying the beautiful day. 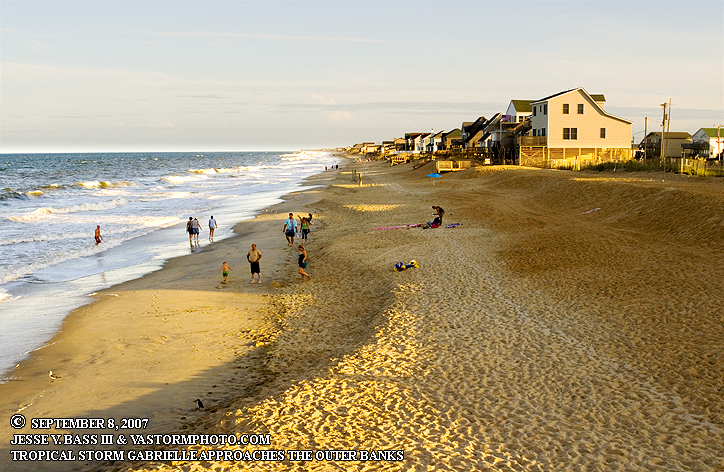 Hard to believe that a tropical storm was going to effect the area the next day. First signs that Gabrielle was approaching and starting to strengthen over night. 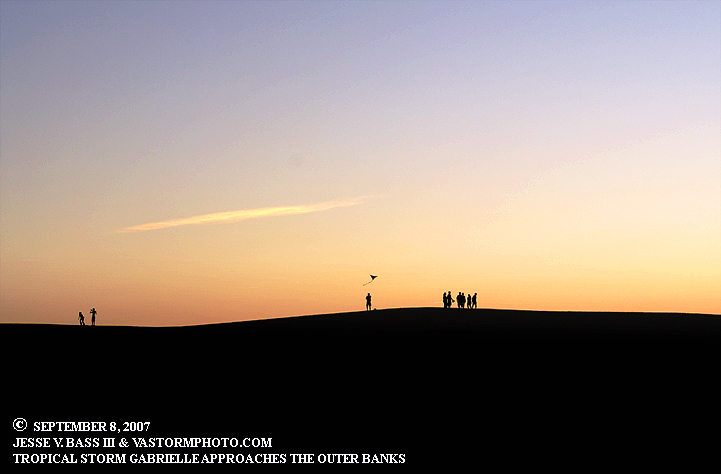 As the sun set on the Outer Banks, folks out flying kites and walking the sand dunes of Jockey's Ridge. Mark with the new trailer in tow which houses the 10 meter wind tower at the Coast Guard station in Hatteras Village. 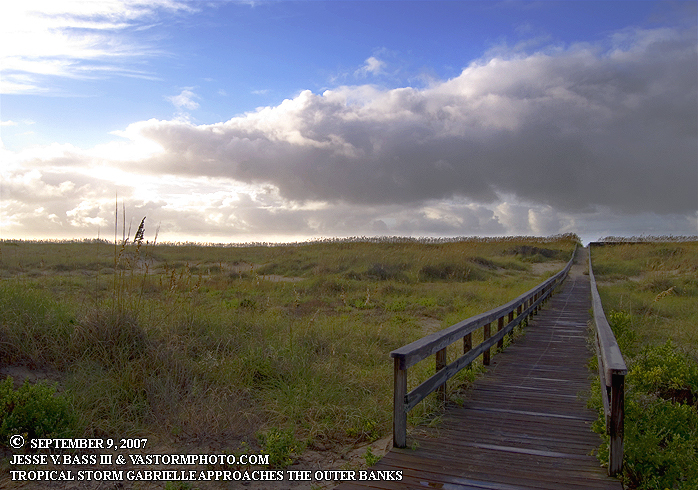 Early morning Sunday with breaks in the clouds and Gabrielle still to our south off the coast making her way to make landfall near Cape Lookout and Harkers Island. 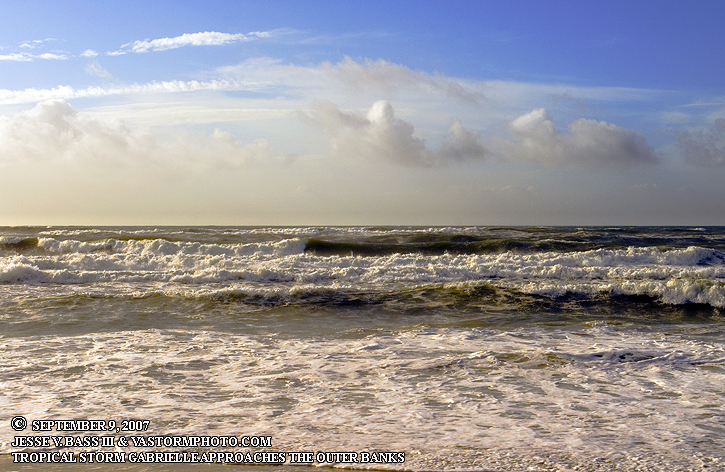 Rough seas and big waves batter the coastline as Gabrielle is being sheared once again to our south. 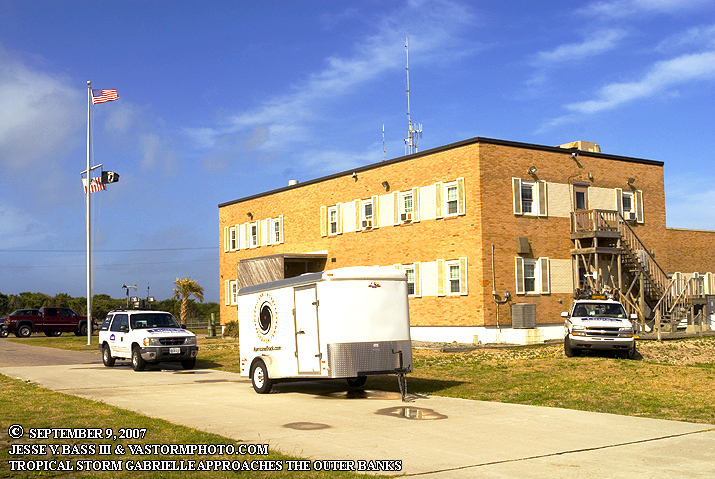 Two storm cases and the new 10 meter wind tower set up and running at the Coast Guard station in Hatteras Village. 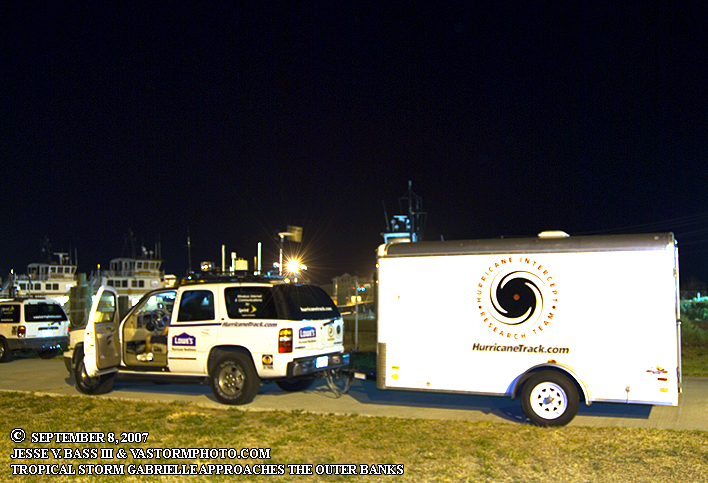 Our vehicles and the new trailer in front of the Coast Guard station in Hatteras Village. Gabrielle's center had made landfall near Cape Lookout but the rain and thunderstorms were still near the coast as the low level center moved inland and northward through North Carolina. This is what we saw the rest of the day, blue skies before packing it in and going home.